Today i am down 11.5 pounds from where i started – 3 pounds down from yesterday. I still feel tired a bit during the day. My hands are a bit dry and my face seems to be getting clear one day and the next clear is a found memory. Today i noticed my sense of smell seems to have increased. I was in the shower, and had just put some shaving cream in my hand. When i used that hand to push the hair away from my face, i could smell the shaving cream so strongly it over overwhelming. It smelled horrible. Even tho i have used this shaving cream for years, and have smelled it many of times, today it was very offensive. I have noticed that i am more aware of smells around me. I can smell all the fruits on the table from a few feet away, and they smell so good. It has been a bit of a challenge to drink enough water. I find that days i drink more water, i feel better. I have started putting a water bottle next to my bed and desk and before i eat anything, i take a few drinks. Sometimes after a drink, i am not hungry anymore. I was very hungry all day today. I woke up hungry and had a strawberry, banana, spinach, vitamineral green, and protein powder smoothie. I then had another banana. 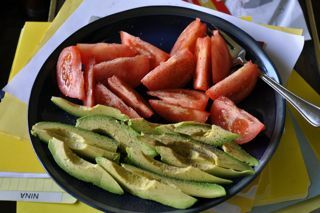 Then a couple tomatoes then another plate of tomatoes with an avocado. For a while, i felt full. Then i wanted something sweet. I had an orange, then 2 nectarines. 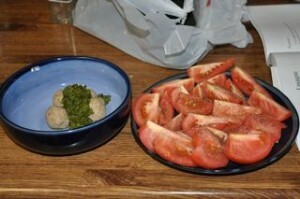 For dinner, i made Not meal balls from Raw Food Made Easy For 1 or 2 People . They were pretty good. 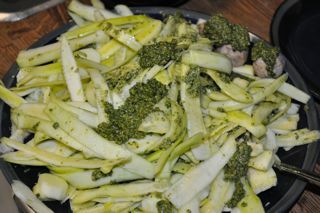 I served them with pesto and zucchini noodles. Mom was the only one who wanted noodles. I just wanted more tomatoes (so that is what i had) and a couple not meet balls slathered in pesto. I went back an hour later for more tomatoes. 15 days done! Half way there. I am so excited by that, but at the same time, i dont have an pulling need or want to eat something not raw.. at least not today. Lets see how Lindsay did on her Day 15. I woke up sore today. I worked-out hard yesterday, and it felt great, but I fell it today. My focus was better today and I’m feeling a bit better too. I’m beginning to be more conscious about trying to see if there are any patterns between what I eat/do and how I feel. One thing I’ve noticed is that I’m still a bit sloppy around some of my habits. I’m getting better, but I think if I had a few structures in place it would help. I also noticed that I’ve been eating the same foods and not enjoying the whole food thing. The reason for not having a lot of choices available is because I have not devoted the time that would be necessary to find out what things I like to have more choices. I think that I’m almost afraid to commit to it. When I talked to Adrienne about this she recommended a couple of books for me to read and get some more information. I’ll be looking through them over the next couple of days. In regards to food, today was rather interesting. As I work from home, most of my days are spent at home, where there are structures in place to support the raw vegan food trial. However, today I had an appointment and the person asked that we meet a mall. We met in the Starbucks (I’ve already had to turn-down coffee for this trial, so that wasn’t a big deal). But, at the end of the meeting my associate asked that we exit towards the Starbucks/Mall by way of the food court…that sucked. Everything smelled tasty and just as we were near the end some dude popped out with chicken samples. Ordinarily, I would have tried it, but I told him no thank you and kept walking. I was proud of myself. When I got home Adrienne made these really yummy meatless-meatballs with pesto. They were quite tasty. I have noticed that I don’t feel like I can go out socially when I have so many restrictions on my food choices. All the places that would usually be on the bill are currently out of the question. I know that there are restaurants that cater to the raw vegan way of eating, but I haven’t done the work to find them because I’m only doing this for 30 days (I also know that I could do the work anyway and just keep eating there after the 30 day trial, but it just hasn’t been a priority). At this point, I think my way of eating has been influenced for the better, but I am still looking forward to Nachos, beer, and muffins. This entry was posted on Monday, March 16th, 2009 at 3:14 am	and is filed under Raw Food. You can follow any responses to this entry through the RSS 2.0 feed. You can leave a response, or trackback from your own site. Adrienne, congrats on losing 11.5 pounds so far on the raw diet! That’s a good bit, and more then just water loss! Lindsay – congrats on resisting the temptation at the food court! Congrats to both of you for having made halfway of this Raw Food Trial! !